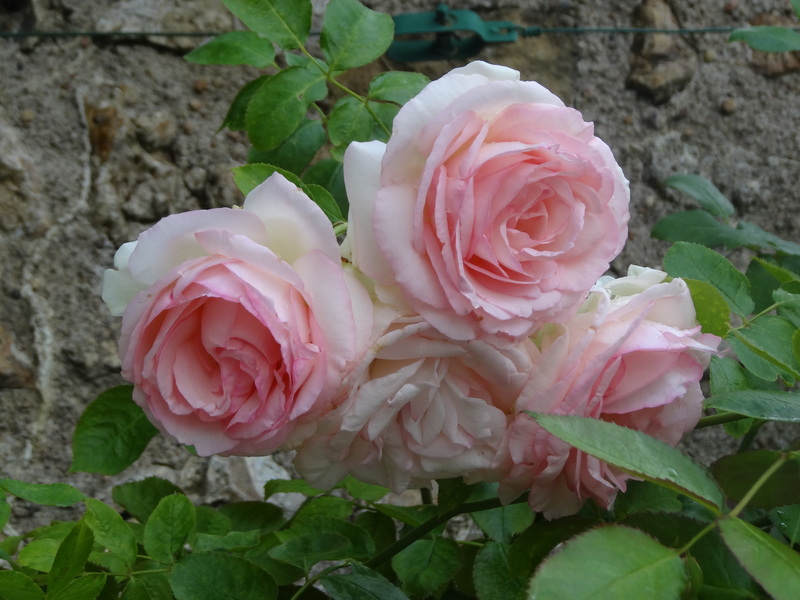 French accents in the garden – giving your garden a little va-va-voom! ← Da Vinci’s last garden. 1. 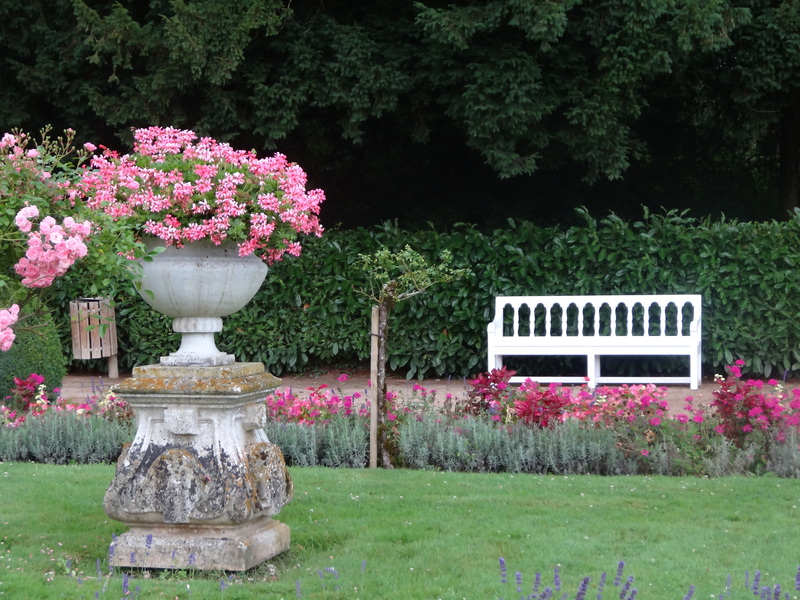 Restraint is key, whether it be colour, planting or statuary. 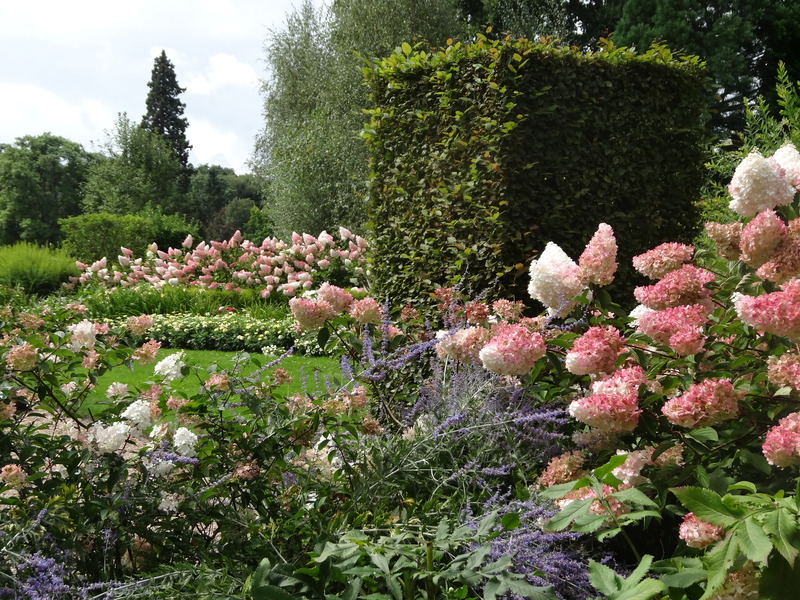 Structure and formality were the hallmarks of the jardin a la française. More here. Less is (nearly) always more in French gardens, so stick to a colour palette of pastels – I like Farrow and Ball’s “Green Blue” for doors and wooden furniture. 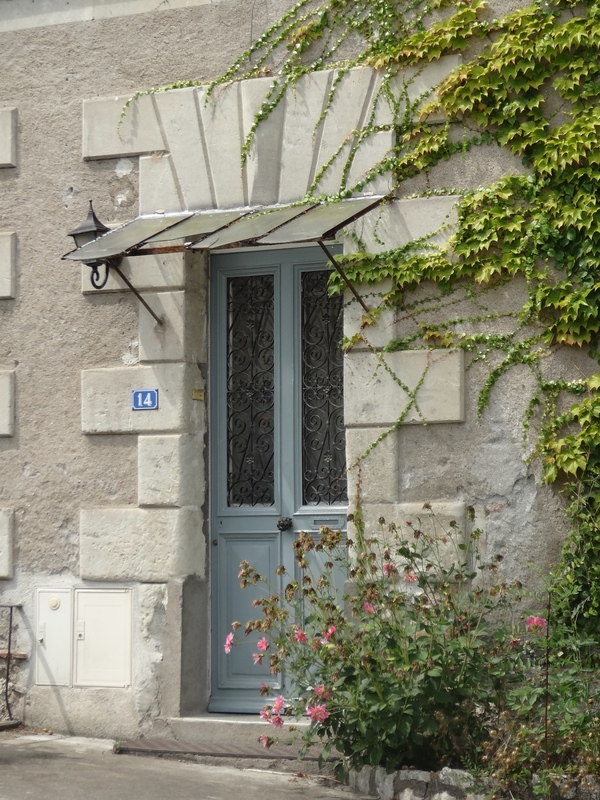 Blue-gray paintwork on a French door. Try filante.com for French style numbers. 2. 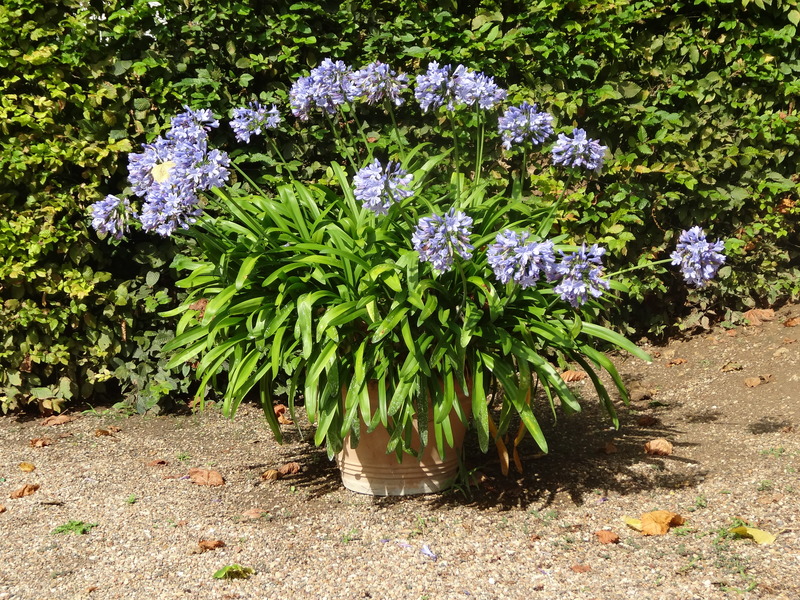 Key plants are lavender, wisteria, agapanthus and rosemary, with pastel shades of blues and pinks predominating. Agapanthus in a terracotta pot. Single species planting is common; hydrangeas, hortensias, somewhat out of fashion in England and Ireland, are a favourite. This year I noticed the showy Hydrangea paniculata ‘Vanille Fraise’ (‘Renhy’), a product of French breeders, making a big appearance. Pink trailing geraniums were everywhere for summer planting in pots and windowboxes. 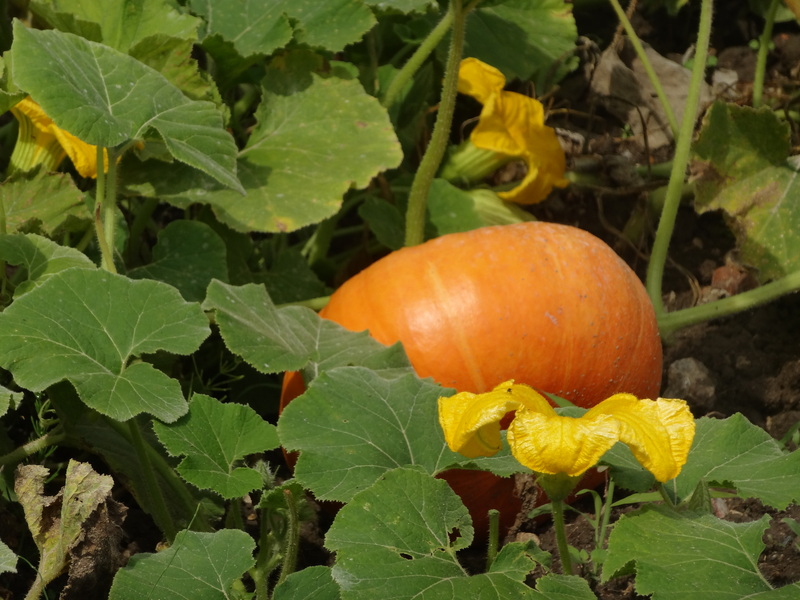 3.Potagers, or ornamental kitchen gardens dating from the French Renaissance, are often found on a small scale, with herbs and vegetables, as well as flowers for the house, in regimented rows. 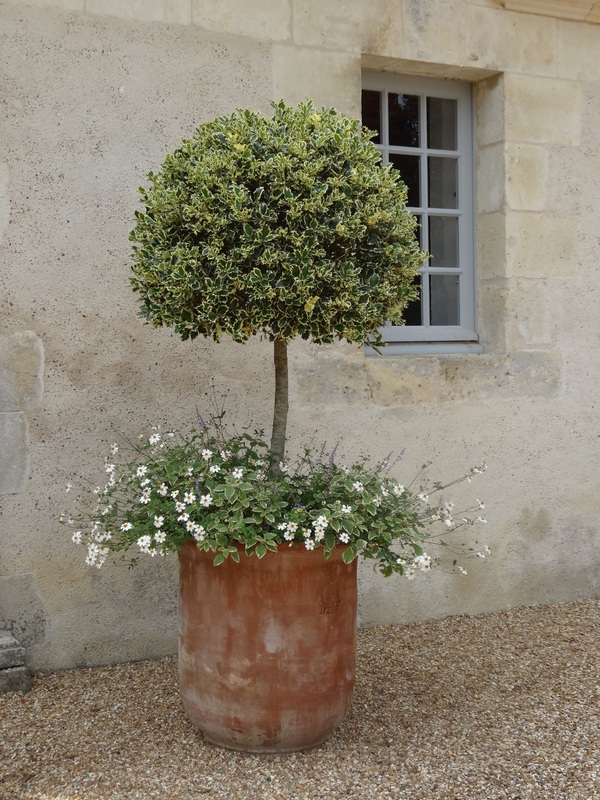 4.Terracotta pots, the bigger the better, add that Mediterranean look. 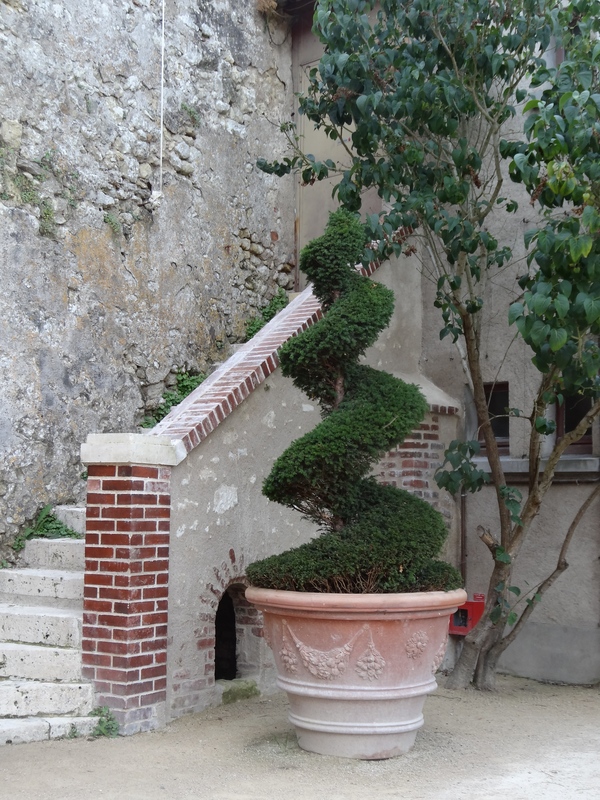 Topiary and terracotta pot on a gravel terrace. 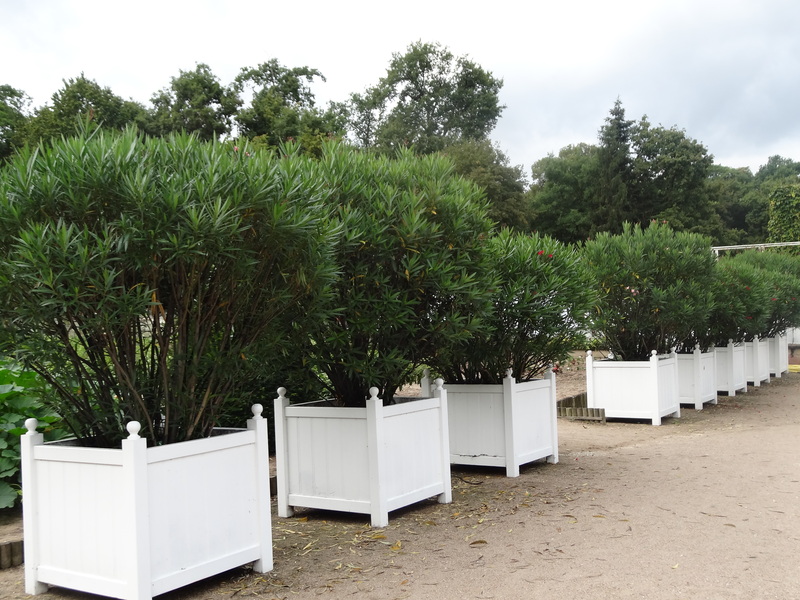 And of course, Versailles tubs or planters. There are many reproductions available. 5. Topiary is used for year round structure – all the great gardens have plenty of it, but smaller gardens often have one or two specimens to add interest. All beautifully clipped of course. 6. Gravel and stone are the order of the day for paths and terraces. Gravel has the added advantage of being easy to spread and less expensive than laying stone but will require maintenance and can become a nuisance when traipsed into the house. 7. Treillage or decorative trellis or latticework, not always intended to support climbers, but to add interest to blank walls or as trompe-l’oeil to create a three-dimensional illusion. 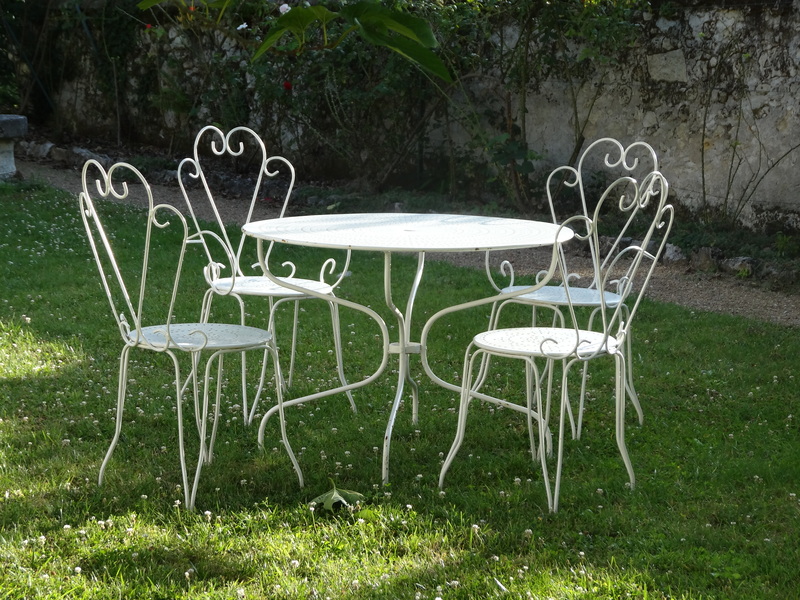 8.Garden furniture – white metal cafe-style sets, of which there are many reproductions available. Or folding park chairs – I’ve picked up a number of these in brocantes. Large old wooden tables placed under pergolas suggest long summer lunches with friends and family – just add a provençal tablecloth, baguettes and camembert. Bon appétit! Some of your observations on French gardens can also apply to the French flute music I studied when I was younger! 🙂 A bit restrained, not heavy and flashy. 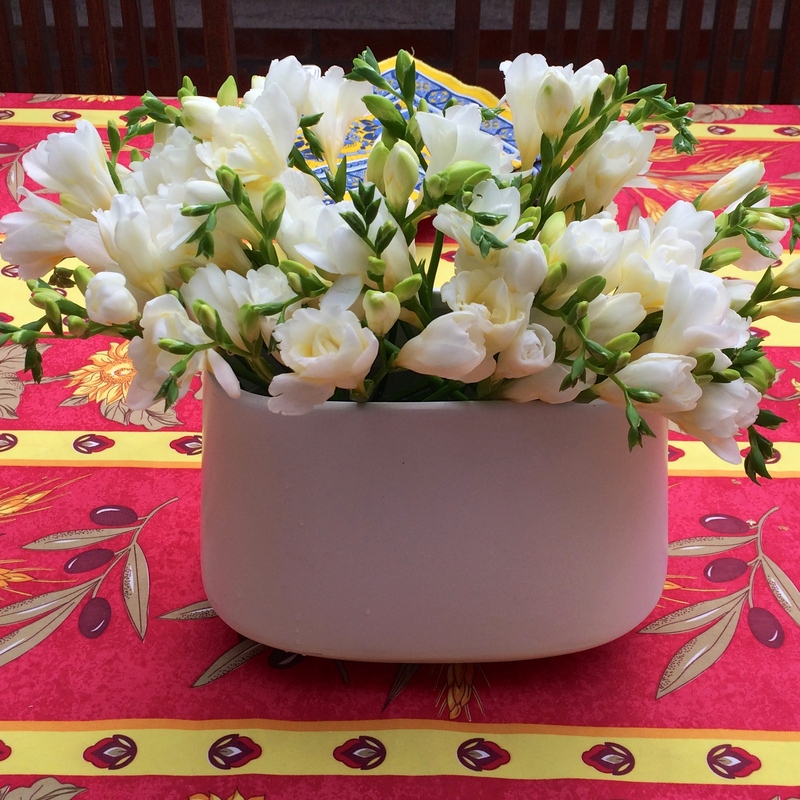 It was difficult for me, an American native-English speaker, to effectively project the french style. Native French speakers have such a beautiful, light way of playing! That’s fascinating Cindi. 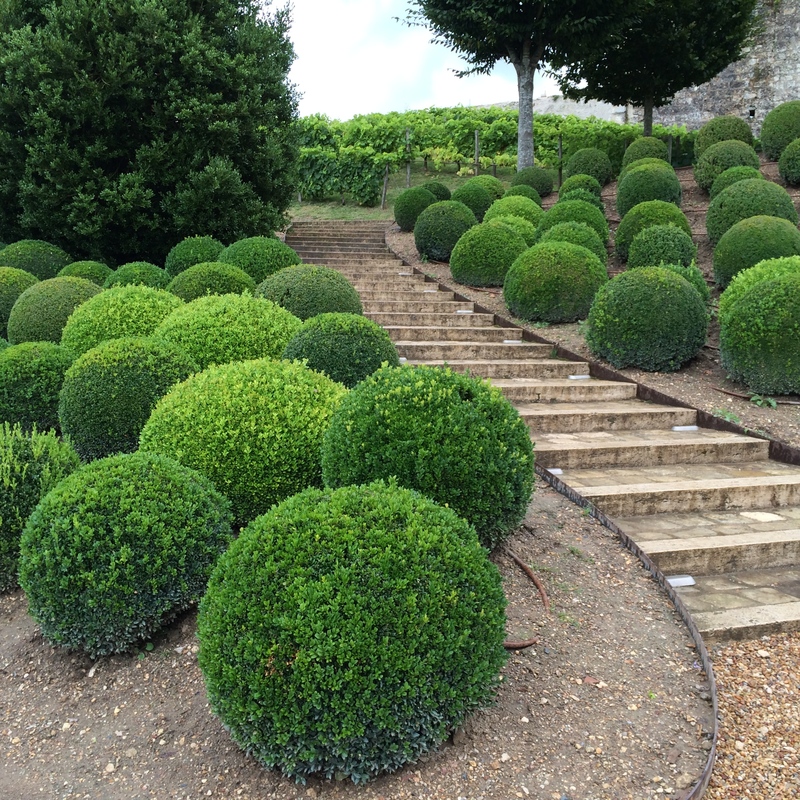 My gardens are often said to have a “French look”, but yet trying to distil what exactly that is, is not easy. The French do have innate style I think which is quite difficult to emulate – in fashion, interiors, exteriors and, it seems as you say, music. I’d love a home of my own there, but we’re lucky enough to have some very good French friends! I love the lifestyle, or just their style! I quite agree! Lots more pics to come in the coming weeks to whet your appetite. A dream indeed …. I love the picture with the hydrange garden. That is just gorgeous. I would like that picture as my screen saver. Thanks for sharing! Pleasure – feel free to use the hydrangea screen saver! Thanks Sylvia! Yes, the roses caught my eye, growing on an old wall along a country lane. Absolutely gorgeous!! !… I loved the set of photos you have posted here… Beautiful. Thanks! Also known as H. paniculata ‘Renhy’, has been available for a few years so seeing more of it in gardens now. I thoroughly enjoyed your photos and information, Jardin. Thanks for sharing the fruits of your recent trip. A pleasure Jet. Glad you enjoyed the post. 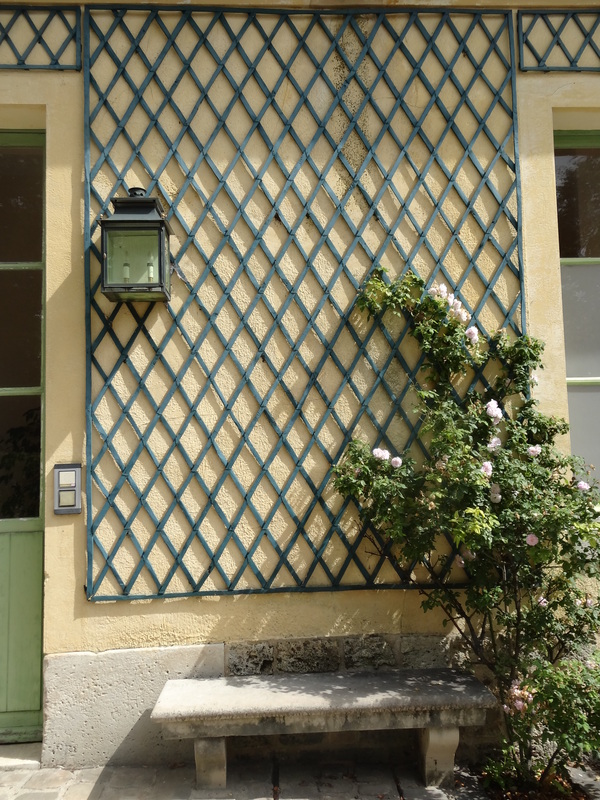 Decorative trellis, restraint and pastel shades of blue… et je suis au paradis! Many thanks! Glad you enjoyed the post!